On Saturday 23rd December the first Feed the Homeless project, which was created by our coaching supervisor, Adam Field, took place in Central London. The project that he decided to embark upon was a great success with 20 homeless people being fed that evening. Adam was supported by another member of the coaching team, Fahad Aldihis,i as well as his brother Steven Field. They started at Waterloo and worked their way around several areas to achieve their goal. This project was supported by the funds they raised on their GoFundMe page which surpassed the target of £300, with the final amount raised being £365. I decided to work on this project as a way of giving back to those less fortunate and the expressions on those faces that we fed that night were priceless; to put a smile on someone’s face who faces daily fear, loneliness and the changing weather on the streets of London was the best part and we briefly spoke to each person to give them a sense of belonging. England is a developed country and sadly we still have poverty on our streets and in our towns. 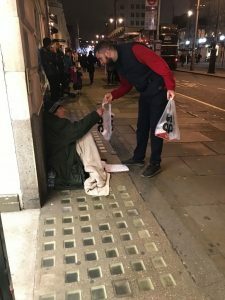 I am lucky enough to have a roof over my head, clothes on my back and food on my plate when I finish a day at work; sadly that isn’t the same for everyone. Next year I am going to aim for a much larger scale project to support even more of those living on our streets. Thank you to everyone who donated as you helped us achieve our goal. It was an absolute pleasure to come along and help feed the homeless that evening with Adam and Steven Field. “The world is a dangerous place, not because of those who do evil, but because of those who look on and do nothing”. I think it’s always nice to do something good for others no matter what their situation. Every homeless person has a story and shouldn’t be judged on appearance. It’s good to see people smile and feel less alone than before. Thank you to those who donated. Help out whenever you can! Excellent evening giving food and talking with the homeless; I really enjoy giving something to those less fortunate. 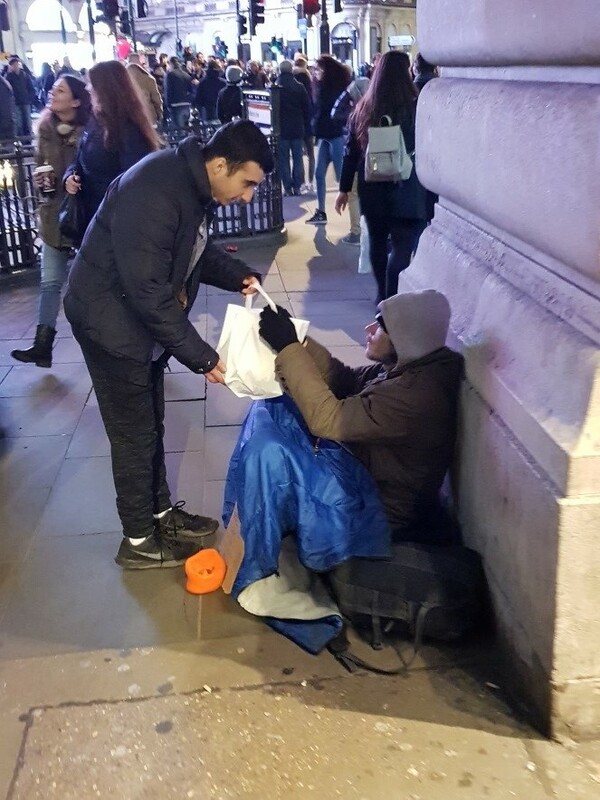 Those who are more fortunate to have a home and clothes on their back seem to forget those who are in need and we moan about small things when, if you look at the bigger picture, they aren’t even worth thinking about let alone moaning about. Try and help more people in 2018.